By Jenny Tang · March 19, 2016, 12:01 a.m.
At the age of 39, Dube sits at the top of the Canada West women’s hockey league as the top goalie and is a mother of two and a full-time firefighter who is finishing up her undergraduate degree this year. 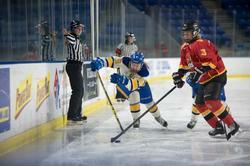 By Jenny Tang · March 18, 2016, 8:17 p.m.
With CIS Women's Hockey Championship going full steam ahead, the UBC women’s hockey team has continued their campaign with a win against the number five ranked McGill University Martlets. The 'Birds won 4-2. By Jenny Tang · March 17, 2016, 4:38 p.m.
Women’s hockey has done it again. By winning against the University of Manitoba Bisons, they brought home another banner three years after winning their first ever Canada West title in 2012. Now they’re returning to Calgary for nationals. By Jenny Tang · March 6, 2016, 2:59 a.m.
Thunderbird Shiayli Toni opened the scoring in the game. At the eighth minute of the first period she scored her first goal of the post-season off of an assist from ’Birds Cailey Hay and Jenna Carpenter-Boesch. By Jenny Tang · March 4, 2016, 7:35 a.m. 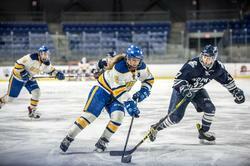 This week, the UBC women’s hockey team is facing off for the Canada West crown against rivals University of Manitoba Bisons. 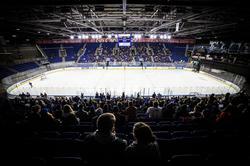 For the first time ever, the final CanWest game will be played on home ice. By Jenny Tang · Feb. 29, 2016, 7:37 a.m. The women’s hockey team made history on Sunday night. After surviving two back-to-back elimination games, the ’Birds held on to a 3-2 victory against the Regina Cougars to bring the Canada West Final series to home ice next Friday. By Jenny Tang · Feb. 25, 2016, 9:11 p.m.
It’s time to get pucked up. 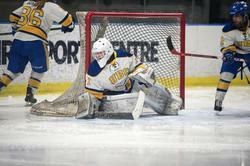 The UBC women’s hockey team are kicking off their playoff campaign after finishing second in the league as they face off the Regina Cougars this weekend at the Doug Mitchell Thunderbirds Sports Centre. 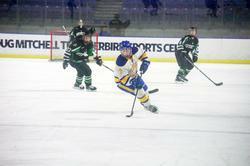 By Jenny Tang · Jan. 11, 2016, 9:13 p.m.
After being shut out Friday night 2-0, the UBC Thunderbirds bounced back in a big way, coming out victorious on Saturday afternoon with an overwhelming 6-2 win against the Mount Royal University Cougars. By Jenny Tang · Nov. 16, 2015, 9:28 p.m.
With a 1-0 overtime victory on Friday and a 4-3 win on Saturday, the ‘Birds now sit in first place in the Canada West League. By Jenny Tang · Oct. 26, 2015, 7:30 p.m. It was a face-off against two bitter rivals at the Doug Mitchell Thunderbird Sports Arena on Saturday afternoon. Following a 2-1 win on Friday night the women's hockey team was looking to extend their winning streak, but were stopped short by the Manitoba Bisons in a crushing 4-1 loss. By Jenny Tang · Oct. 5, 2015, 10:50 p.m.
After the sports reviews two years ago resulted in teams being stripped of their varsity level status, UBC Athletics and Recreation have collaborated with nine clubs to form an alternative competitive stream for AMS-recognized sports clubs. 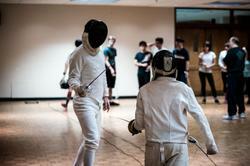 The stream will allow the clubs to compete under the UBC Thunderbird name in competitive, non-varsity leagues. The new student-run teams will be able to compete for UBC in sports that are not available as varsity sports at the university. 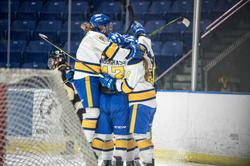 By Jenny Tang · Sept. 13, 2015, 12:50 p.m.
Friday night was a welcome back event for many people but for the UBC women’s hockey team it was a chance to break the ice with the new season. By Jenny Tang · Aug. 27, 2015, 6:22 p.m.
It’s summer! No midterms, no papers, no finals; you’ve got all the time in the world. Make the most out of your last week of summer with our suggestions. By Jenny Tang · June 1, 2015, 11:12 a.m.
After a year of being banished from the UBC Athletics’s Varsity program, the UBC softball team was given their varsity status back last Monday. By Jenny Tang · April 19, 2015, 2:57 p.m. There were people from London, there were people from France, but most of all, there were a lot of underpants.